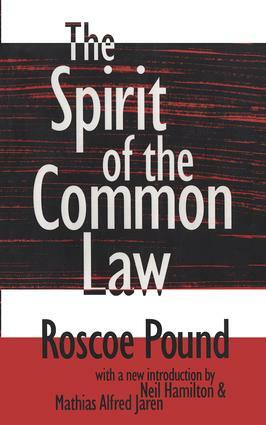 The Spirit of the Common Law is one of Roscoe Pound's most notable works. It contains the brilliant lectures he delivered at Dartmouth College in the summer of 1921. It is a seminal book embodying the spiritual essence of sociological jurisprudence by its leading prophet. This work is both a celebration of the common law and a warning for common law judges and lawyers to return to and embrace the pragmatism and judicial empiricism that define and energize the common law. The two fundamental doctrines of the common law, Pound writes, are the doctrine of precedents and the doctrine of supremacy of law.In an earlier preface, Justice Arthur J. Goldberg writes that The Spirit of the Common Law will always be treasured by judges and lawyers for its philosophy and history, but more importantly for Roscoe Pound's optimism and faith in the capacity of law to keep up with the times without sacrificing fundamental values. It is a faith built upon the conviction that the present is not to be divorced from the past, but rather that the past and the present are to be built upon to make a better future. Neil Hamilton and Mathias Alfred Jaren provide a biographical introduction to the book. They discuss the various influences upon Pound's scholarly pursuits and they analyze many of his writings that led up to The Spirit of the Common Law. This volume is a necessary addition to the libraries of legal scholars and professionals, sociologists, and philosophers.